Some would say that curtains are what makes a room. Often an expensive investment purchase, a beautiful set of curtains in your living room, dining room or bedroom is the perfect finishing touch – which is why you want to keep them in pristine condition. Curtain cleaning is one of those things that needs to happen occasionally to keep your home fresh and clean. However, if you’ve ever struggled to take down large curtains, take them to be dry cleaned and then rehang them, you will know how cumbersome it can be to handle large volumes of fabric. Then there’s the danger of shrinkage and damage that can be the accidental result of conventional dry cleaning. Surely, there must be a better way? At Apple Clean, we offer In Situ Curtain Cleaning, meaning you won’t have to take your curtains down for cleaning, whatever size they may be. It’s a convenient and very effective way to attend to your curtains professionally, leaving them looking, feeling and smelling fabulous. • Our expert cleaning operatives will remove all dust and odours that may have built up in your curtains over time without the need to remove them for their fittings. • We will pre-test your curtains to ensure that only the most effective cleaning products are utilised. • We will clean the facing fabric of your curtains, along with any linings (including thermal linings), pelmets, swags and tails. • For the ultimate protection in and around your home, additional services including flameproofing are also available on request. Apple Clean have over 25 years’ experience in private and commercial curtain cleaning. Our team offers a reliable and professional service to clean your curtains to the highest standards. 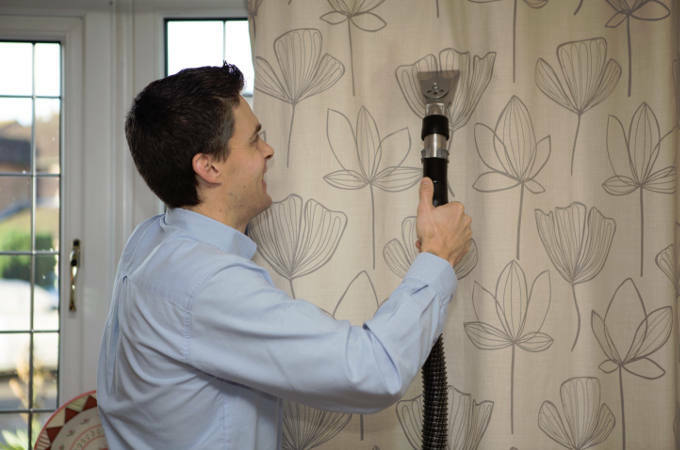 With no taking down or re-hanging required, In Situ Curtain Cleaning requires no drying time, saving you both time and money. For more information or to make a booking, please contact Apple Clean on 0800 587 4571.